When the MAC Bloggers’ Obsession Collection launched this month, I was excited. It is always good when a company embraces the opinions of those who truly love products, colors, and are tuned into what is missing from the market place. We've already seen great things when bloggers partner with nail polish manufacturers like Zoya, Rescue Beauty Lounge, and Barielle. None of the Lipglass shades grabbed me, but I had high hopes for a couple of the shadows. Jealousy Wakes is a fantastic green that I am going to covet and use sparingly. It’s like the biggest, clearest, sparkliest emerald that could possibly be captured in a pot. Kudos to Christine Mielke of Temptalia for developing a true green shadow that isn’t too gold or too blue. It should work well on all skin types. It is the shadow that will eclipse Parrot for makeup collectors. But I was even more excited about the possibilities of Hocus Pocus. Billed as a sooty charcoal gray, I had heard some buzz that it had a khaki cast and the sparkle in the early swatches gave me high hopes that Hocus Pocus was going to be Lancome’s Erika F. coming stateside after all of these years. I am lucky to have a Lancome Erika F. shadow that little Miss Blogdorf brought me back from Paris. 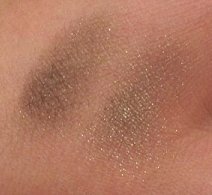 I wore it every day for a month straight, which is unheard of for me because I often like to keep it simple with a light vanilla shadow for work. But Erika F. has a smokey, sagey wisdom to it paired with the fun of a antique golden microglitter. So, my hopes that the new MAC Hocus Pocus would wow me like Erika F. weren’t dashed when I opened the box. I thought it had potential. But when I put it on, and it is darker, grayer, and it loses its sparkle. It was wishful thinking on my part that the greatness of Erika F could be duplicated. I like the Lancome formula better, and the color is really something special. I'm going to have to continue to use it sparingly. Damn it! That said, Hocus Pocus is probably a more wearable shadow because it doesn’t have as much shimmer and sparkle to it. It’s dark and smokey, and when used wet it makes a great liner. And no offense to Ms. F., but I like the bewitching name better. Thank you to Lianne Farbes of The Makeup Girl for providing us with the most versatile shadow in the MAC Bloggers' Obsession collection. 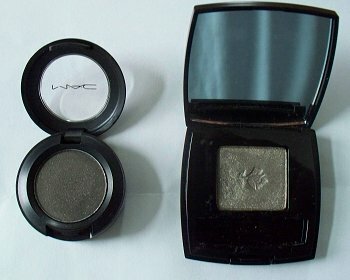 The photos feature Lancome's Erika F eyeshadow and MAC Hocus Pocus only. Lancome's Erika F is not available in the United States. It can be found at Lancome Boutiques across Europe and Asia. Just look at the most used eye shadow in the tester unit.....that will be Erika F!!!!!!!!!!! 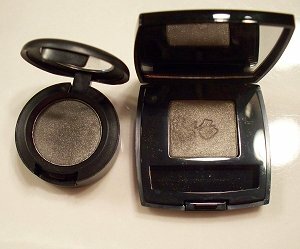 How does it compare to Laura Mercier's baked eyeshadow in Black Karat? Did you see Cafe Makeup's comparison of Chanel Illusion D’Ombre Long Wear Luminious in Epatant to Erica F? She thinks it's pretty close match. I love Jealousy Wakes too! :) I'm really glad that MAC was able to partner with really amazing bloggers... the colors are really somthing. I must live under a rock. Well, it's my age, I still use revlon. This sounds nice. Not much helps at my age. Enjoy your youth. Isn't it fun to be young. I haven't forgotten. My wishful thinking is that this blog would come back. Are you gone forever? Are you okay? Will you ever be back? Are you on vaca? Was it something we said? We're sorry...we'll be good. You always had such an excellent blog - my favorite. Are you going to return? As of August 23/11, Erika F is for sale on Strawberrynet. Plus, just saw Erika F on FragranceX. I need Erica F! I can get the Mac but it is too dark for daytime wear. I would like to try them together.